Two Spartan sub threes and three personal bests at Sunday’s Manchester Marathon. 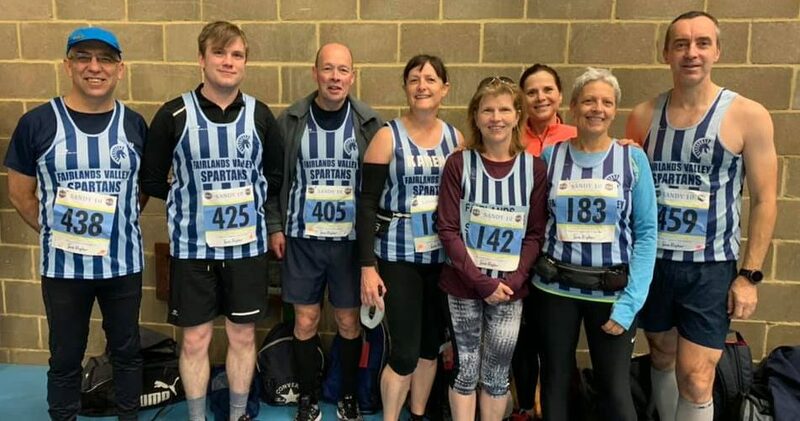 Beating three hours for the 26.2 miles is one of club runners “blue riband” targets and two from Fairlands Valley Spartans smashed it. MARTIN BLACKBURN had nearly five minutes to spare with his new personal best of 2 hours 55 minutes 10 seconds. PAUL HEWETT said he felt strong throughout and even had a little sprint finish in him in the last mile. He finished in 2:58:49. That’s a new PB by seven minutes! TIM SABAN came in with 3:31:55 and YUKO GORDON in 3:33:43. GRAHAM BLACKBURN finished in 4:12:05 and ANNIE LOVATT who spent all the winter training with the Spartans was delighted with her personal best of 4:43:43. This was a big city marathon with 13,659 finishers. There were ten Spartans at the Sandy Ten on Sunday. PETE SMITH was going well for eight miles in his first open race for some time but eased off for the last two to finish in 81 minutes exactly. JIM BROWN was being “sensible” following his marathon seven days before and double effort the previous day and came in with 1:24:23. On a grey overcast day STEPHEN PIKE finished with 1:27:22; KAREN PALMER with a well-paced 1:29:39 to beat 90 minutes and TRUDIE MOLLOY, who loved the course, in 1:30:55. LUKE GURNEY came in with 1:33:32; KAREN LIDDLE and TRICIA HOPPER crossed the line together in 1:38:19. The tremendous ten were completed by SOPH GEORGIOU in 1:43:53 and ROGER BIGGS in 1:56:50. There were 477 finishers in the event which was organised by Biggleswade Athletic Club. PENNY SCHENKEL and JIM BROWN were within sight of the Olympic Orbit and racing round the Victoria Park Five Mile race in Hackney on Saturday afternoon. This was a flat two laps of a figure of eight event with some amazing runners at the fast end. Jim was 90th in a new season’s best of 39 minutes 7 seconds. He beat last year’s time by 1 minute 41 seconds. Penny was 106th in a new personal best (PB) of 44 minutes 48 seconds, an improvement of 16 seconds. This was a lovely but fast open club race with just 113 finishers and shorter events for younger runners. The Adidas City Run is something different – how far can you run in an hour? Spartan DUNCAN FLOUNDERS had a go and covered 8.3miles in the 60 minutes. This was his first time trial style event. It was on a one mile lap course around St Paul’s. There were distance markers/mats every 0.1miles to measure your progress. He said he aimed to do eight laps so turned it into an 8 mile race and managed a bit extra. 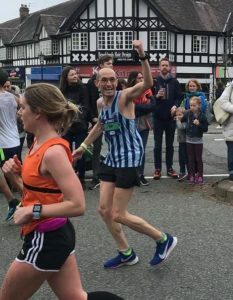 Duncan said it was difficult to get away from the crowd at the start which he then caught again after three miles so the course always felt busy. Decent event but the bag drop was a shambles, not needed on a cold morning! At the Cambourne 10K Spartan SHERYL HANN was 491st of 750 runners in 61 minutes 9 seconds. She was tenth FV60. NIC PATTMAN completed the St Clare’s Hospice 10K at Harlow in 1:04:26. At one point less than two weeks ago she didn’t think she’d be able to take part due to an injury and was so pleased to make it to the start line and across that finish line. She came ninth in her age group out of a total field of 450 runners. On Saturday John Nelms and Jackie Downes ran the South Downs way 50 mile ultra marathon. Starting in Worthing, 400 runners traverse the very hilly and at times very exposed route with over 6000 ft of elevation following the national trail to Eastbourne. The finish is on an athletics track where Jackie out sprinted John to finish 10 seconds ahead of him in just over 11 hours. Next up for Jackie is the London marathon in three weeks, for John is another ultra marathon the 100 mile Thames Path in May. On Saturday 6th April, Sharon and Mike Crowley walked the third Capital Challenge in 7 hours 52 minutes. This was a 27.9 mile route, from Waterloo in the heart of London to Stratford, finishing in front of the Olympic Stadium. A cool and overcast day made for good walking conditions. The Testway 40 attracted ADRIAN BUSOLINI. This 40 mile race, organised by Andover Trail Runners, went down the Testway from Linkenholt to Totton. He was tenth in 7 hours 34 minutes 32 seconds. More than thirty Spartans are running the London Marathon and others have targeted other Spring marathons. On Sunday many took enjoyed a twenty mile training run from Marriotts Sports Centre. There were also options of roughly five, ten and fifteen miles. April’s ‘Stripy Saturday’ saw 33 Fairlands Valley Spartans head out in their vests to run at various Parkrun Events. PB results were recorded for new Spartan FIONA CLARKE in Stevenage in a time of 24 mins and 30 secs and for PAUL JENNINGS on the Gunpowder course in 25 mins and 36 secs. NICOLA KENNEDY was the first lady to finish the Holkham run in 22 mins and 14 secs, alongside RICHARD KENNEDY who completed as the 7th man in 19 mins and 49 secs. MADELEINE PRITCHARD was the 5th lady in Letchworth in 24 mins and 23 secs, while in Stevenage VERITY FISHER was the 7th lady in 25 mins and 18 secs and LOUISE PACK the 11th in 25 mins and 42 secs. On his first visit to the Harlow location, JOHN ROXBOROUGH finished in 23 mins and 01 secs as the 30th man. Top 100 finishes came in Stevenage for MARTIN DUDLEY in 22 mins and 50 secs, JAMES MCSWEENEY in 23 mins and 11 secs, STEPHEN SMITHSON in 23 mins and 30 secs, NICK GILL in 23 mins and 33 secs, and LEE PICKERSGILL in 25 mins and 14 secs. 382 MARTIN BLACKBURN 2:55:10 Sub Three. PB. 563 PAUL HEWETT 2:58:49 Sub Three. PB. Parkrun Results – Saturday 6th April. 81 6 Fiona CLARKE 0:24:30 new PB! Gunpowder 54 44 Paul JENNINGS 0:25:36 new PB! Live in or near Stevenage? Like running? 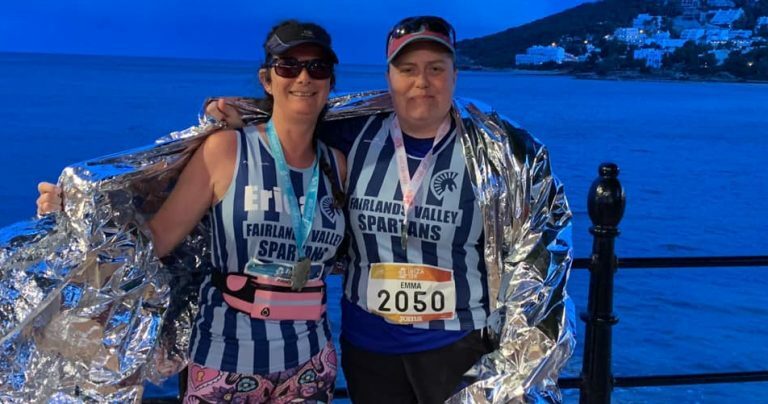 Fairlands Valley Spartans is your local running club and is on the up! In February 2019 FVS had 345 members, 175 women and 170 men. They encourage participation by all. The Spartans have a varied training programme to suit those who want to run 5 kilometres through to full marathons. 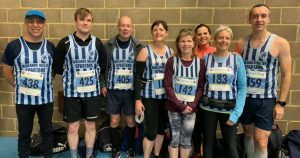 It puts back into the sport by organising events such as the Stevenage Half Marathon, Fairlands Valley Challenge, the Relays in the Park and events for the Mid Week and Cross Country Leagues. Try a few sessions before joining. Membership is only £41 per year which includes UKA affiliation. Concessions are available. Membership forms are available on the Spartans website www.fvspartans.org.uk Please ask if you would like a paper copy. You can also join online.